When buying a house or investment property it is imperative to have a pre-purchase property inspection, particularly in Queensland where homes are vulnerable to some form of timber pest damage and attack as most homes contain timber elements in their construction. A pre-purchase inspection report by Sea Shore Building and Pest Inspections is a combined building report and timber pest report in one easy to read report. This way you can you can be made aware of any defects, damage or potential problems, including any timber pests such as termites, prior to making a final decision to purchase the property. A pre-purchase property inspection will comprise of a full external & full internal visual inspection, including sub floor & roof void accessible areas of the property that you are about to purchase. The information provided from the pre-purchase property inspection will be able to help you make a sound financial decision, plan for renovations, budget for repairs and ultimately make an informed decision about your purchase. So if you are in the market for a property get your property inspection done by one of best building and pest inspection companies in the Sunshine Coast, Sea Shore Building and Pest Inspections. You or a representative are free to accompany Sea Shore during your comprehensive Sunshine Coast pre-purchase property inspection. 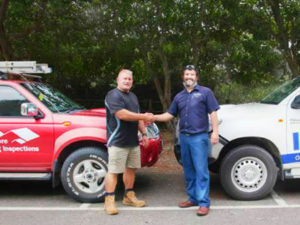 Sea Shore Building and Pest Inspections is a locally owned & operated Sunshine Coast building & pest inspection business. We believe in providing a thorough and professional Sunshine Coast pre-purchase property inspection to all of our customers. We service all local areas of the Sunshine Coast Queensland including but not limited to Marcoola, Noosa, Mooloolaba, Maroochydore, Nambour, Caloundra, Buderim, Coolum, Landsborough and the Sunshine Coast Hinterlands. Your house is the biggest investment of your life, make sure you know what you are buying. Book your Sunshine Coast pre-purchase property inspection here.